Signed only at the turn of SR 15 from Conway Road to Hoffner Avenue, CR 506 is a 7.107-mile long route looping north from SR 528 through the city of Belle Isle. The western portion of CR 506 is a five lane boulevard connecting SR 527 (Hansel / Orange Avenues) in Pine Castle with U.S. 17-92-441 (Orange Blossom Trail) along Oak Ridge Road. The segment along Hoffner Avenue navigates through residential areas between Little Lake Conway and Lake Conway east to SR 15. Southward from Hoffner Avenue, CR 506 travels along a combination of Conway Road south, Judge Road west and Daetwyler Drive south to McCoy Road, the north side frontage road of the Beachline Expressway. Oak Ridge Road becomes a part of CR 506 east of Orange Blossom Trail (U.S. 17-92-441). The county road however is unmarked as it advances east between the Florida Shores and Sky Lake Oak Ridge neighborhoods. Photo taken 03/31/18. A signalized entrance to Oak Ridge High school follows on Oak Ridge Road east. Neighborhoods line the boulevard north along adjacent Lake Jessamine. Photo taken 03/31/18. Winegard Road leads south as a through route to the Sky Lake community and Florida 482 (Sand Lake Road). Photo taken 03/31/18. Entering the unincorporated community of Pine Castle, CR 506 (Oak Ridge Road) intersects SR 527 (Orange Avenue) south. SR 527 separates through Pine Castle and the adjacent city of Edgewood along a one-way couplet with Hansel Avenue north. Photo taken 03/31/18. County Road 506 resumes east from SR 527 (Orange / Hansel Avenues) along Hoffner Avenue through the city of Belle Isle. Photo taken 09/03/17. Hoffner Avenue fully enters the Belle Isle city limits on the northeasterly curve at Labelle Street. Speed limits are set at just 25 miles per hour, with routine enforcement. Photo taken 09/03/17. Hoffner Avenue makes a number of S-curves along the isthmus across Lake Conway. This scene looks ahead of Oak Island Road at the Pleasure Island community. Photo taken 09/03/17. Hoffner Avenue spans a waterway connecting the two sections of Lake Conway across a 1981-built bridge. Photo taken 09/03/17. Continuing eastward between the Lake Conway Estates and Windsor Place subdivisions, CR 506 (Hoffner Avenue) approaches the commercial intersection with SR 15 (Conway Road). The lone reference of CR 506 incorrectly references the turn southward on Conway Road as west instead of east. Photo taken 09/03/17. SR 15 heads south from Orlando through Conway along Conway Road to Hoffner Avenue and CR 506. The state road turns east along Hoffner Avenue to reenter Orlando at SR 436 (Semoran Boulevard) while en route to Narcoosee Road. Photo taken 03/28/08. The remainder of CR 506 is unsigned, as it follows Conway Road south from SR 15 to Judge Road west. Widened to four lanes in 2008, Conway Road is a divided arterial extending south from SR 15 to the Beachline Expressway at Tradeport Drive. Cove Drive intersects CR 506 east from the Conway Gardens community across from an apartment complex. Photo taken 09/03/17. Conway Road south at Judge Road. Judge Road becomes Lee Vista Boulevard east to the commercial corridor along SR 436 (Semoran Boulevard). CR 506 joins Judge Road west between the Conway Groves subdivision in Belle Isle and Crescent Park in Orlando. Photo taken 09/03/17. Conway Road continues one mile south from the split with CR 506 at Judge Road to a parclo interchange with SR 528 (Beachline Expressway). Photo taken 09/03/17. McCoy Road intersects Conway Road just ahead of a loop ramp to SR 528 west toward Interstate 4. Photo taken 09/03/17. Separate sections of McCoy Road make up the north side frontage road of the Beachline Expressway. The east segment from Conway Road links with North Frontage Road to the Lee Vista commercial area along Semoran Boulevard. Photo taken 09/03/17. Conway Road north at the loop ramp for SR 528 west and the continuation of McCoy Road east to North Frontage Road during four-lane construction. Photo taken 03/28/08. Conway Road enters the Orlando city limits east of Crescent Park and proceeds north to intersect Judge Road (CR 506). Photo taken 03/28/08. 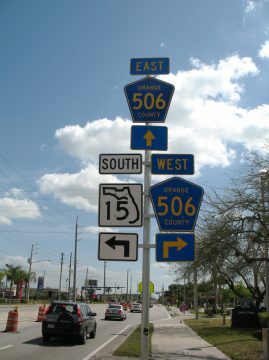 County Road 506 accompanies Conway Road north one mile along the Belle Isle city line to Florida 15 (Hoffner Avenue). CR 506 turns west along Hoffner Avenue into Belle Isle while Florida 15 overlays Conway Road north to Conway and Orlando. Photo taken 03/28/08. Hoffner Avenue narrows to two lanes as CR 506 travels west through the Lake Conway Estates community. A 1981-built bridge spans a narrow waterway linking the two sides of Lake Conway. Photo taken 03/28/08. Speed limits reduce to 25 miles per hour west of the Lake Conway bridge as Hoffner Avenue navigates a series of curves through the Pleasure Island and Venetian Gardens neighborhoods of Belle Isle. Photo taken 03/28/08. CR 506 (Hoffner Avenue) leaves the Belle Isle city limits beyond Embassy Street. Hoffner Avenue runs along the Edgewood south city line from just ahead of SR 527 (Hansel Avenue) north to Orange Avenue south. Photo taken 03/28/08. Florida 527 separates along Hansel Avenue north and Orange Avenue south through Pine Castle and Edgewood. The state road north leads to Gore Avenue in Orlando. Photo taken 03/28/08. Oak Ridge Road stems west from Hansel Avenue (SR 527 north) in Pine Castle. The boulevard intersects SR 527 (Orange Avenue) south ahead of an at-grade crossing with the CSX Railroad / SunRail. Photo taken 05/05/18. Winegard leads south to the Sky Lake community and SR 482 (Sand Lake Road) west of Pine Castle. Photo taken 05/05/18. CR 506 (Oak Ridge Road) passes south of Lake Jessamine and the Florida Shores neighborhood ahead of U.S. 17-92-441 (Orange Blossom Trail). Photo taken 05/05/18. Unmarked CR 506 ends at U.S. 17-92-441 (Orange Blossom Trail). OBT bee lines north to the west side of Edgewood, Holden Heights and Orlando. The arterial continues south to Florida Mall, Orlando Central Park and Hunter's Creek. Photo taken 05/05/18. Oak Ridge Road continues beyond the truss arm signals at OBT to the north side of Orlando Central Park, the Southwood and Camellia Gardens neighborhoods and the Premium Outlets by Interstate 4 in Orlando. Photo taken 05/05/18.